I first saw oriental dance in 1991 at a Christmas party organised by my Martial Arts club and the Oriental Dance studio that had recently opened in a neighbouring building. The beautiful movement and enchanting music together formed an attractive whole and, with the New Year, I decided to participate in a beginners' class becoming hooked immediately! Since that day, Oriental Dance has taken over an ever-increasing part of my life and, despite an academic education (MSc, biology and MA, English translation), I am now a full time Oriental Dance teacher and performer. I have also graduated in the Oriental Dance Teacher Training Programme organised by Masrah Association. Performing and teaching Oriental Dance have also taken me outside my hometown, and on the wings of dance, I've been fortunate to have the opportunity to travel both in Finland and abroad. Teachers are highly significant in every artist's life and for me, the most significant are Tuija Rinne and Jaana Åhl in Finland, Beata and Horacio Cifuentes from Germany and the Egyptian masters Raqia Hassan, Mahmoud Reda and Yousry Sharif. As a teacher, I emphasise strong dance technique which is an essential element of all good dance. With a firm base to build on, it is easy to let the music carry you and take you where you want to go! Even though studying dance, creating choreographies and teaching my students do take a lot of time, I still haven't had enough of this dance: my spare time is spent surrounded by heaps of material and sequins designing and sowing my own costumes. Recently, I've started making costumes for other dancers as well. Masrah Association is a venerable organization arranging workshops and also teacher training for oriental dance teachers. I have the honour to act as one of the trainers in the Training Programme. As a member of the Masrah Dance Company, I have also participated in several national and international dance productions. Seitsemän Hunnun Tanssi (Dance of the Seven Veils) is a national oriental dance association organizing, e.g., dance festivals. They also used to provide teacher training for oriental dancers; I acted as one of the trainers in their Training Programme. Mizmar Association was active 2004–2013, and during that time I acted as the Secretary and the Artistic Director. 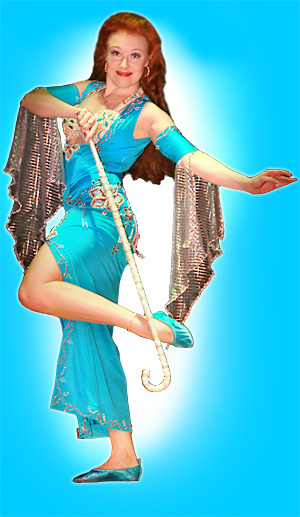 Karkadeh Association, founded in 2012, organizes workshops, shows and other dance-related events. Currently, I'm acting as Chair. I am also a member of the Tampere-based association Mihrimah ry.